2019 Fall Schedule coming soon! Baby Boogie - age 0-15 months or walking. Get out and GET DOWN with Baby Boogie! 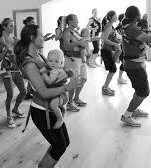 A fun class for Mommies or Daddies and baby. Mommy or Daddy will learn line dances with baby in tote. A great way to exercise while spending time with your little one. Baby will have fun listening to music and moving along with you too! DRESS CODE: Participants should wear comfy clothing, clean sneakers, and your SECURE baby carrier. Moms & Tots - walking age - 35 mos. Parent and child will enjoy this fun, interactive "one on one" time. Using music and props with the assistance of parent, child's motor skills, coordination, and musicality increase through the enjoyment of dance movement. Class formatted with flexibility to accommodate the varied development levels. Besides the physical benefits, this class provides child with focus, motivation, accomplishment and social interaction. Dancewear not required. DRESS CODE: Dance wear optional but not required. Alternatively participants can wear comfy clothing and CLEAN sneakers. The perfect introductory dance class for children age 3 & 4. Class focuses on the "fundamentals" of dance while setting a solid foundation for learning. Movement concepts, directions, and musicality are learned with just the right balance of structure and fun! This class serves as a the next level for students age 4-5 whom have completed "Dance FUNdamentals" or as an introductory class students age 5 new to dance not in school yet. Pre-Ballet is formatted to reinforce and build on Dance FUNdamentals content to develope a more age appropriate skill set while introducing basic ballet movement. Create a special memory to cherish forever! Daddies and their Princess will learn dances together and enjoy some light refreshments. Special keepsake for Princess. Grandfathers, Godfathers, Uncles, or older brothers welcome to bring their favorite Princess. $39 per couple. 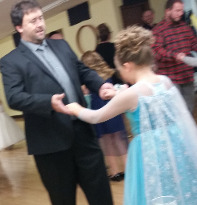 Check back for dates & times for our 2019 Princess Balls.